Separate egg whites from egg yolks, being careful not to break yolks. Set yolks aside to use in another recipe. In a dry, medium bowl on very high speed, beat egg whites until stiff peaks form. Peaks will be bright white when stiff. You can set beaters in mixture, lift them out, and egg white peaks will remain formed. Continue to beat egg whites at a high speed as you gradually add granulated sugar, about 1-2 tablespoons at a time. After sugar is incorporated, blend in mint flavoring and food coloring. Use a rubber spatula to gently fold in miniature chocolate chips to the meringue. Drop meringue by scent teaspoonfuls onto prepared baking sheets, about 1 inch apart. Place baking sheets in the oven. Turn off oven. 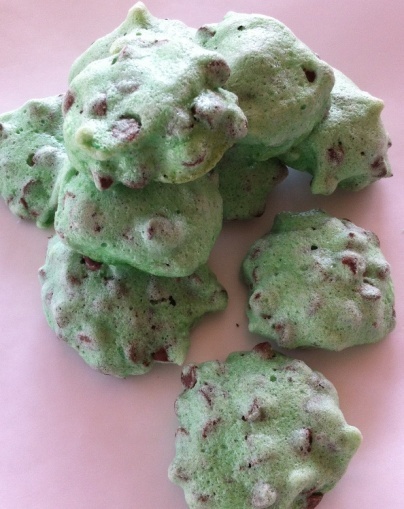 Leave puffs in the oven overnight. In the morning, remove baking sheets from the oven. Puffs will be crisp and dry. Slip puffs off parchment paper. Store them in an airtight container. Before preparing Mint Puffs, double check bowls, beaters, and spatula to make sure they are completely clean and dry. Both egg whites and sugar molecules attract water. Water inhibits proteins from breaking down as egg whites are beaten. That’s why plastic, wet, or greasy bowls and beaters often prevent meringue from forming stiff peaks. Wipe bowls and utensils with a wedge of lemon to remove any traces of grease and dry thoroughly with a paper towel before beginning to make meringue.